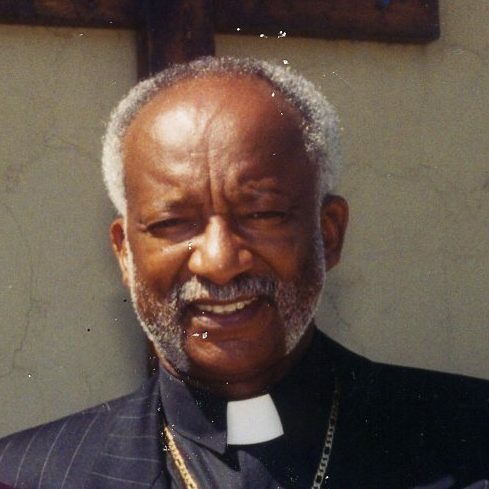 Bishop Walter Terone Shephard was born December 1, 1942 in Fosters, Alabama to the union of the late Lee Anthony and Clara Bell Shephard and departed this life on January 8, 2018. God had a calling on his life at an early age where he joined Dry Creek Baptist Church. On July 8, 1963 “T” as he was lovingly known, married his soul mate Geraldine Banks. God blessed this couple with over 50 years of marriage and three loving children. Everyone that had the honor and privilege to know Walter knew that he had a deep love and passion for family. God had Given Bishop Walter Shephard a vision and a heart for families and lost souls. In July 1996, Bishop Walter Shephard was faithful to that vision and Acts of Faith Community Crusade Church was birthed. Bishop was not only the founder of Acts of Faith but the epitome of the name. Bishop Shephard blessed many with his wisdom, teaching, and most of all his unconditional love. One of Bishop’s favorite scriptures was Matthew 6:33 But seek ye first the kingdom of God, and his righteousness, and all these things shall be added unto you. Bishop loved spending quality time with his family. H loved fishing, and being out in the outdoors. He also loved traveling and cruising with family and friends. He is preceded in death by his parents Lee Anthony and Clara Bell, son Fredrick, sisters Jettie Lavender, Willie Mae Smith, and brother Edward Donnell. He leaves to cherish his memory with his wife Geraldine, daughters Chavela (Douglas) Ware, Shanequa (Byron) Pointdexter, grandchildren Nyesha (Bart) Clayton, Fredrick, Terone, Mickael, Amari, and Breah, seven great-grandchildren and a host of family, friends, Spiritual daughter, Pastor Mildred Tate and the Acts of Faith Church Family. I am so sorry to learn of your loss. We will be praying for you and your family. To the Shephard family, you have my condolences in your loss. It is truly difficult to lose someone you love in death. T knew that God’s Kingdom is the only hope and solution to ALL humans problems. By means of the Kingdom, the resurrection of the dead will take place very soon (John 5:28). Our condolences to the Shephard.family. May the memories you share bring you comfort during this difficult time. May the love of God, the grace of Jesus Christ, and the fellowship of the Holy Spirit be with you all. your Loved one My prayers are with you at this time. To the Shepherd Family may God give you peace knowing “T” is a faithful servant. Be Blessed. Love and condolences. My deepest condolences to the family and friends of Bishop Shepard. I remember him and First Lady from my childhood days at Metropolitan and they both were always loving people. Prayers are with you all from the McCleary/McCarter Family. Bishop Shepherd will be truly missed. He was a great example of what it means to be a true “Christian”. He always kept it real and would not lead you wrong. I am so glad I can still call him my spiritual father because he was father to many. He was definitely a shepherd over the flock. I am deeply sorry for your loss but do remember GOD doesn’t make a mistake he came and gave Bishop rest. We will see him again. May GOD bless your whole entire family including the Acts of Faith Community Crusade Church Family. He leaves behind a great great legacy. May God loving hand of mercy and grace be upon you all. T0 Cha Cha and Shephard Family, you have my deepest sympathy at this time. May God continue to keep you in His care.